A delicate palette of warm pinks and oranges characterizes this stunning mix. This combination, including Catchfly, Scarlet Flax, Chicory, and six others, will be a real show-stopper in your flower beds and borders. 1'-2' in height. Special mix pricing: Save 29% over per-pound quantities on the special one-acre pack: 10 lbs, $250.00. 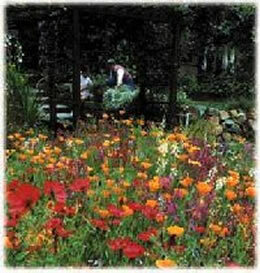 Contains 100% wildflower seed, no inert material. A rich blend of the hot colors of the southwest! Great in areas with little rainfall and warm summer months!